The acclaimed UK Premiere production returns in 2019. The original UK production by Vertigo Theatre Productions starring Dale Vicker and directed by award winning Craig Hepworth returns in 2019 to Manchester prior to a London run in association with Samuel French. A comic melodrama that evokes the 1960’s “grande guignol” films that featured aging stars such as Bette Davis, Joan Crawford and Lana Turner. Ex-pop singer, Angela Arden, is trapped in a hateful marriage with film producer Sol Sussman. Desperate to find happiness with her younger lover, an out of work TV actor, Tony Parker, Angela sets a plan in motion that will see all of the Sussman family’s dirty laundry aired out for once and for all. From a poisoned suppository, LSD, a vengeful daughter, a drunk maid and a son not all together there, Die, Mommie,Die! will transport you to 1960’s Hollywood, to meet the most dysfunctional showbiz family ever. 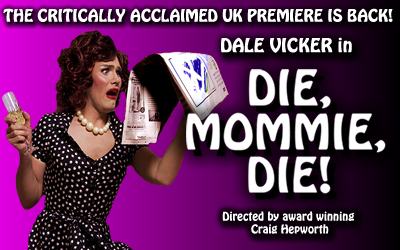 First premiering in the UK in 2012 to 5 star and rave reviews and with a lead “performance to die for” by Dale Vicker, we are bringing the show back, bigger and better than ever. So get ready Manchester, you have been asking for her and now here she is, Angela Arden is ready to make her grand entrance, and she demands your attention.